Why settle for a postcard of the Mona Lisa, when you could have a hand-carved leaf engraved with her mysterious face? 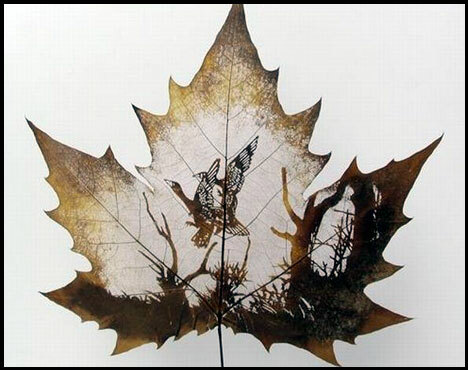 Making art with leaves isn’t a new idea, but several online purveyors have taken the medium to a new level. Offering up intricately cut images of everything from landscapes to the female form to even Napoleon – yes, you can have the face of the famous emperor cut into a leaf and framed – sustainable art just got a little more interesting. Typically of the Chinar tree, native to India, Pakistan, and China, each leaf is dried and the outer layers are delicately removed with a knife, while carefully keeping the veins intact so not to compromise the stability of the form. A single leaf-work may take months of work, and once complete it is then preserved within a frame. Complex and telling, this amazing art form can be seen as a metaphor for our current culture – nature’s fragile beauty manipulated by our modern industrialized world in order to create something compelling. Why settle for a postcard of the Mona Lisa, when you could have a hand-carved leaf engraved with her mysterious face? 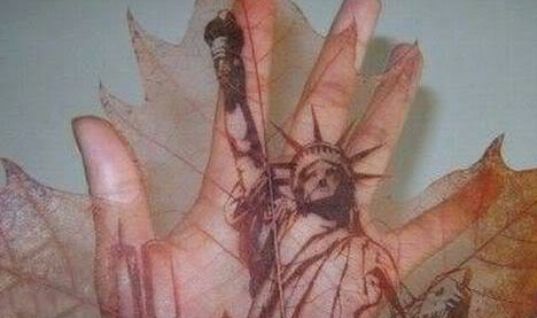 Making art with leaves isn't a new idea, but several online purveyors have taken the medium to a new level. Offering up intricately cut images of everything from landscapes to the female form to even Napoleon - yes, you can have the face of the famous emperor cut into a leaf and framed - sustainable art just got a little more interesting.